How Relevant is Manny Pacquiao Now? My first thought was that I didn’t know if I would characterize it quite like that, but there is no doubt that he is very much alive to do what he’s done so well throughout the last decade or so of his career, which is to make money, both for himself and his opponents. Whether he is a real player in the battle for supremacy in his weight division is an entirely different question to be addressed. Time and again, the ESPN announcers asserted that everybody wants to fight Pacquiao. Well, sure they do, because (a) He is a viable pay-per-view entity in a sport that doesn’t have many of them, and (b) The risk-vs.-reward quotient might be very much in their favor. In other words, they can pick up a big win, and a lucrative one, in a fight they probably should not lose. 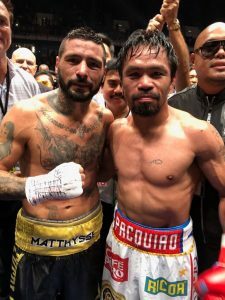 Pacquiao improved his record to 60-7-2 with his 39th early win in a 7th-round knockout of Lucas Matthysse, who was the WBA “regular” champion at 147 pounds. How significant was this victory? Well, that’s a good question, because Matthysse came in as the kind of opponent who seemed designed to make Pacquiao look good. He was slow, plodding, not all that skilled, not good enough defensively, no match for Pacquiao’s speed, and thus in no position to counterpunch. He also didn’t exactly come to wage war. His approach appeared to be geared toward loading up for one power punch – which he is capable of delivering – but was seemingly frustrated that it didn’t happen. No, we can’t get into a fighter’s head, and we can’t gauge how hard certain punches hurt, but he looked as if he was looking for a way out after being hit with a half-hook, half-jab in the fifth round (almost immediately after showing more resistance than he had previously) and then stayed on one knee when one would have thought he could get up, following a Pacquiao uppercut in the seventh. I thought Teddy Atlas was on the mark when he said that Pacquiao got the job done, and did what he had to do, but did not have a whole lot in front of him (RIGHT in front of him, we might add, for whole fight). You can’t really fault him for any of this, and he did show a lot of energy. And don’t underestimate the moral boost he may have gotten by scoring his first win inside the distance since the Miguel Cotto fight in 2009. Pacquiao was asked that in the ring after the fight. He couldn’t just say “I’ll have to talk to my promoter,” because he is, for all intents and purposes, his own promoter now. So he didn’t get specific. I think the truth is, he doesn’t really know. Crawford would seem the most likely opponent of those three, because of the connection that still exists between Pacquiao and Top Rank’s Bob Arum. And for that reason, there is also the possibility of Vasyl Lomachenko, who is currently the WBA’s lightweight champ. For a fight like that to happen, there would have to be a meeting somewhere in the middle as far as weight is concerned. Some might argue this, but Pacquiao isn’t likely to advance his career against any of those three welterweight champs. There is some intrigue against Loma, since there is a built-in handicap, as the Ukranian began his career as a featherweight and would be making quite a leap. But at the same time, he is the kind of whirlwind that Pacquaio may have been once, but isn’t now. The punches he landed against Matthyssee aren’t nearly as likely to find their target against any of these guys. There is that other possibility, which is a rematch with Jeff Horn, who beat him controversially in Brisbane a year ago. There still has to be something sticking in Pacquiao’s craw about that fight, enough so that one of the reasons he cut himself loose from Freddie Roach – allegedly – is that Roach did not complain about Horn’s rough tactics during the fight, instead waiting until after the bout to do so (where it didn’t do a whole lot of good), then adding some other commentary that was largely unwanted. Horn lost rather decisively to Crawford, but he has credentials for this purpose because of the win over Pacquiao. And almost as soon as Pac-Man got out of the ring, Horn was calling him out. There was a rematch clause in the contract, which Pacquiao did not exercise immediately because of his duties as a senator in the Philippines. And Horn’s promoter, Dean Lonergan, thinks that Pacquiao’s performance this past weekend makes his guy’s win look all that much better. Maybe so, but according to reports, including one coming out of the Los Angeles Times, Pacquiao might try to give it a go in the United States again to fight one of Arum’s guys. He’s got problems with the IRS, which will take some of his money, so I’ll believe it when I see it. And besides, the big edge for Manny in any negotiations is that HE is the pay-per-view draw, and thus the gateway to big money. None of these five prospective opponents we’ve mentioned can say that they have carried a pay-per-view event. That means Pacquiao has the ability to dictate deal points like where the fight would be held, and Arum admitted as much. And his “independence” as a promoter unto himself might make his word final. We know that Horn, at this moment, is in the midst of talks with Anthony Mundine, the ex-rugby player who has held a WBA super middleweight title and a WBC and WBA super welterweight title. This fight would presumably be at 154 pounds, and Horn would be expected to come out the winner. He’ll also make upwards of $4 million, because these guys can fill a stadium. So he’s got the luxury of being able to grab a big payday even after a pretty one-sided loss, something a lot of guys don’t have. But even if that fight happens, I wouldn’t disqualify a subsequent fight with Pacquiao, in or out of Australia. Remember, none of the fighters who are bigger threats to Pac-Man are enough of a draw that they would necessarily steer him away from a fight with Horn, from a dollars-and-cents perspective. While Pacquiao-Horn II may not be of ultimate importance on the world stage, it will be extremely important to Manny’s constituency (pardon the pun), which would be pretty sizable. And in every fighter’s mind, there is that thought of “getting the win back” when they think it was unfairly snatched from them. This decision is very much in Pacquiao’s hands. He IS the promoter, isn’t he? And you can bet those aforementioned world-beaters will be keenly interested in what he decides. Considering how they’re are all thought to be emerging superstars, maybe Manny Pacquiao IS the most relevant guy out there – at least for the time being.